Have you ever wondered how a diverse national team mentally prepares to compete on an international level? 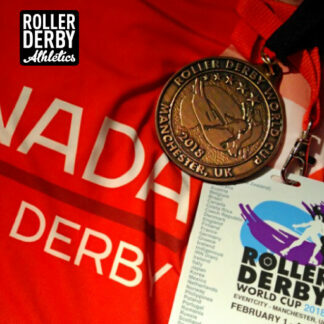 Short weeks ago, the world watched and cheered as athletes represented thirty-eight nations at the third Roller Derby World Cup. Now that the dust has settled, and Team Canada is back home and living in our World Cup bronze medals, I want to pull back the curtain so you can get inside our team’s mental game. When I was appointed head coach of Team Canada in 2016, I knew I wanted to place an importance on mental skills training and preparation. Having competed at the last two World Cups, I had witnessed many athletes and teams crumble under the pressure. My goal was to remove as much unwanted pressure as possible. I wanted the team to focus on our performance, and not on the outcome of the game. We saw some great success with our team strategies, and they are all elements that any coach, team, or athlete could implement. With an inside look on how Team Canada mentally prepared, here are my top 5 coaching tips! Coaches and athletes need to buy in and see the value of mental toughness. Coaches need to highlight the passion for mental performance, and help facilitate its development. It’s important for everyone to remember that athletes are not born with a strong mental game. Being mentally tough requires time, practice, and effort. Athletes can be physically, technically, and tactically ready to perform but distractions, unnecessary pressures and/or a negative mindset can hinder their performances. This is where having the right mind frame comes into play. When athletes see the importance of, and have the tools to strengthen their mental game, they’re more likely to take control of their own mental skills training. Some Team Canada athletes took charge and began engaging in practice goals, post-practice reflections, visualization, breathing exercises, and even positive self-talk. Team before the individual: This was the environment we developed throughout the last year and a half. It did not matter who was on the World Cup charter or how many games someone played; EVERYONE played a vital role on the team. This helped take away the internal competition that can be found on a team of this caliber. Instead of trying to fight each other to get on the game roster, Team Canada athletes were supporting and inspiring each other to grow. Positive relationships and camaraderie were the backbone of the team. Team Canada used shared experiences to learn about key mental skills training concepts and to communicate more effectively. For example, during a self-awareness workshop the athletes learned to describe their performances with colours. It was easier for athletes to identify the quality of their performances by announcing their colour (red, yellow, or green). It also made it easier for teammates and coaches to support that athlete’s needs based on their colour. Games were another tool. The day before the World Cup began, we played a game of knots. The entire team was linked together in a tangled mess. The goal of the game was to untangle ourselves without breaking any links. This fun game took thirty minutes to finish. We could have stopped the game at any time, but we kept at it. It was a frustrating activity, but with determination, focus, and clear communication it was achievable. Before certain games at the Cup, I would refer to “knots” to remind the team that we had demonstrated the ability to overcome challenges. If we could play knots for a half an hour, then we would rise to the top of any challenge. Set routines allowed the athletes to gain control in a stressful environment. These routines were used throughout the year leading up to the World Cup, so they weren’t new experiences during crunch time. Routines allowed the team to get into their optimal performance zone with more ease, as their bodies and minds could slip into auto-pilot. Team Canada had routines for roster announcements, pregame warm ups, and post game recaps. Pack / jammer discussions featured in a lot of our routines. These discussions help put the focus and the control back into the team’s hands. I always said that as a coach, if I expect the team to put 100%, then I need to put 110%. The same goes with mental toughness. If I expect the team to be positive, calm, and focused, then I need to lead through example. This piece of advice is for coaches, but also for captains or general leaders on the track. Poise and confidence can go a long way, especially when the pressure hits. Those are the times were the team will be relying on you the most. We worked hard on Team Canada’s mental game to make sure that the team was ready to meet all of the challenges head on, with a positive attitude and a smile. Going into the third place game, we wanted the team to feel confident and focused on what we could do, not what the other team was doing to us. 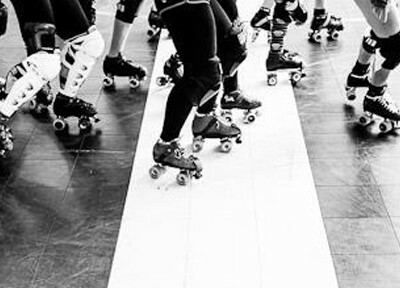 Remember that roller derby is a complex sport, and athletes are always trying to improve and strive for their best. Mental skills training is a key pillar in any athlete’s or team’s development. 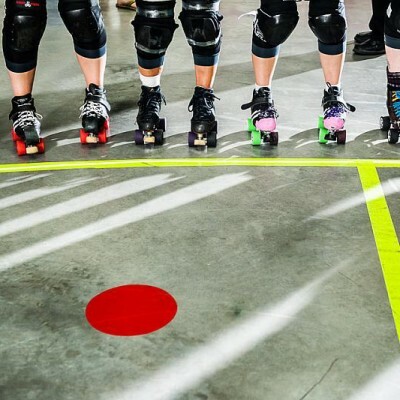 Strengthening your mental game is not just for national athletes, it’s a mind frame that everyone at any roller derby level can improve. How does your team mentally prepare? What are your favourite tricks to help everyone perform optimally when it counts? Tell us in the comments below! Heads Up! I’ll be leading our second annual Confidence Challenge, starting March 5th! If you struggle with feelings of anxiety about your performance, low self-confidence, never feeling quite good enough… this month of focussed mental skills training can help you get into a more confident mindset and unlock your true athletic potential! More details on the Confidence Challenge here.